In 2006, I did a study for a friend who owned a bowling alley. Condidering the lane man and machine were sunk cost. The out of pocket cost to him was $.25 per lane to strip and oil. His machine did them both simultaneously. But, he only stripped twice per week. Another chain house near by did the same study for a cost of $.26 per lane. Comparing those two, I feel confident it isn't a lot to oil. Now, if you go to the ICE oil that back fills grooves or the colored oil, the cost adds up. Average price for lane conditioner is $90-100 per 1.25 gallon container. Or $280-330 for 5 gallons. But, many houses buy it in drums, which brings the cost down. Stripper, which is done periodically not nightly, costs $125 for a 5 gal jug. Common sense ended up prevailing. The 3oz rule will be in effect as of August 1. That is good to know. I already opted a month ago to have my new SON!Q drilled to the upcoming specifications. So August 1 it will be legal. I hate these "studies" not because of anything having to do with equipment but because of what it represents. To me, these studies represent a USBC wasting time, energy, and resources. Not focusing on bringing value to USBC membership. Not focusing on advertising or attempting to lure more bowlers to the game. In the mean time leagues continue to dwindle. Members gripe about value. Many leagues go unsanctioned. Sandbagging seriously infiltrated the USBC Open last year. Those are the things that matter to me and most of us. How do we get more people bowling? Answer that question first; then we can focus on whether or not equipment is too strong, if there's too much oil, and how do we "slope rate" each house in America. I will give the same answer I’ve given for years. If you want new bowlers, then you have to have leagues for new bowlers. Right now, there aren’t any. If you even want to keep your middle skilled and lower skilled bowlers, then you need leagues where they can flourish too. Again, right now these leagues do not exist. The comment was made about all the comments from septeguenarians. Well if you remember “back in the day” you had classes of leagues laid out by skill set. That does not exist today. Leagues are the Wild West. I’ve seen leagues with teams averaging 365 to 820 for 4 person teams in the same league. Look around. The bottom line is that new bowlers do not want to bowl with teams of all 200+ average bowlers who throw nothing but strikes. Neither do your 150-170 average guys. Yet that is what everybody is forced to do because there are no rules for league entry and many are playing below their real ability for easy wins. It also doesn’t help when you shut off all awards for anybody who can’t throw a 300 game or an 800 series. What message do you think you are sending to “new bowlers” by that? Why join a league? Why sanction? To buy someone else’s 300 ring? Seriously. Some guys are earning 8 a year. 300 rings should be once in a lifetime awards. And if you lose it or something happens to it, then let them buy another one - not out of membership money. Then maybe leagues would have money to spend on something other than a couple 300 rings every week all season. The answer has always been the same. It starts with juniors. I started in 1961 at age 13. 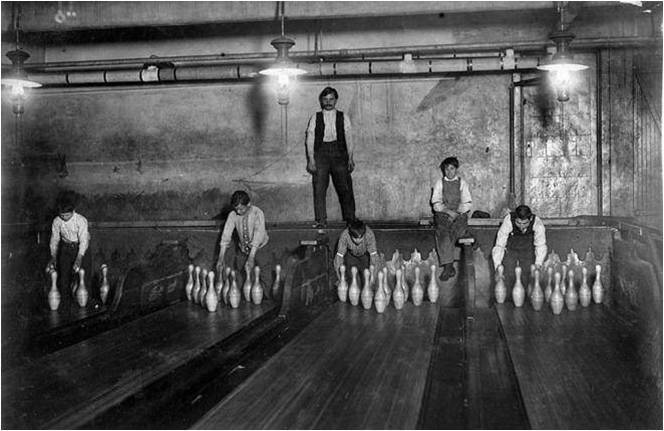 Back then, we bowled for 35 cents a game and shoes were free. Proprietors gave us lineage at cost because they knew we were the future. Today, proprietors charge kids $4.50 per game and shoes are $1.50. Today, we see the results of the Sesame Street approach to education. Kids want 'instant' gratification. They would rather stare into an iPhone than take the time to learn something new. Where I bowl high school kids bowl instead of PE, but they basically just show up and get a grade whether they bowl well or not. I live in CA, so we don't expect much of anyone here. We have places in town where they charge $20 each half hour per person. Not many parents will send their kids into that cost-structure. There's also too many people my age (70) charging $50+ per hour for lessons. We should be willing to give up the instruction for free. I'm lucky. Where I bowl, the owner is a former PBA member and TOC winner, Steve Cook. He allows seniors to bowl for 75 cents a game. Last year it was just 50 cents. His center is so busy the mechanics have barely enough free time to keep the machines working. The answers to dwindling bowlers has always been kids, the industry just isn't paying attention, or worse yet, kids aren't paying attention. 300 rings should be once in a lifetime awards. Where do you see this happening currently? It's been once in a lifetime since August of 2014. If anyone wants a ring after their first 300 or 800, they foot the entire cost. In the 60's, ABC issued 'diamond' rings for a first 300 game. Back then, only 600+ perfectos were shot each year. It was a special occasion. ABC reps would come and check the lanes and the balls to make sure everything was on the up-n-up. Occasionally, they even turned down 300 games for irregularities. Today, any 300 is accepted, regardless of irregularities. So, the bowler can buy themselves anything they want for an award. Enjoy the moment, forget the ring. 82Boat69, my post was concerned with correcting the idea that membership dues paid the last four years were going to pay for multiple 300 rings for someone who already shot 300 before instead of the reality that they would be paid for by the bowler. Not getting an award from the USBC without paying is not an issue for me. I just checked your post history. This was your first post in 5 years, I guess that could be why you didn't know of the rule change. You are correct. I stopped in to read about new weight hole rules. I have not bowled since 2013 for quite a number of reasons. And I used to be a guy who bowled 2 leagues a week and bought several balls a year. It stopped being fun for me years before I finally gave up. One center here burned to the ground. The owners intended to rebuild but never did. Another was a junky old wood house from the 50s that was poorly maintained and ran as tax write off by another business that was finally ran into the ground and closed. Of the 2 centers nearby that are left, one is a another older wood house that sees more business as a party center with disco lights and the other is a very high scoring house that advertises itself as “home of the 300 game.” The game, sport, or whatever they call it these days has serious issues. I have sold most everything bowling related I owned and I seriously doubt I will ever be in another league again in my life. As was previously stated, leagues and bowlers do a lousy job of policing themselves and they are very good at taking the fun out of everything.